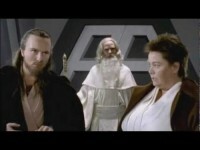 French and Saunders Take on Star Wars! We have all seen Dawn French dance, and she certainly does love to show this skill in many of her routines. If you take her dancing skills and combine it with her comedy style, you end up with a dancing academy that produces plenty of laughs. She teams up with Jennifer Saunders to put together a skit that will keep you in stitches from beginning to end. This skit has some special guests, including Anthony Dowell and Darcey Bussell. It is sure to be a favorite and you will return to it time and time again.